Spring arrived, at last! After a cold and rainy winter pleasant warm days have finally set in and thinner sweaters have replaced wool jumpers which have been stored in boxes for next year’s cold. To welcome spring I decided to dust off the drawer a small collection of recipes I put together last year, for a project that never came to life. The entire collection has been available for a few hours on the blog, then an opportunity made me decide to take it off in a hurry to see whether it was possible to have the work published. In the end, unfortunately, there was no further development but the recipes and photos are so beautiful that I decided to publish them on the blog this year,. I will post two menus a month, for a total of four, until the end of May. Without further ado I start with the first menu, which is composed by four recipes. At the end of May I will publish a link to the complete pdf file, so you can download it and print it. The idea of ​​photographing the recipes directly in the nature, to enhance the seasonality of the recipes, was my ex-husband’s who has had this enlightenment one day while we were drinking tea together. Sergio is one of the most creative and imaginative persons that I know and I won’t deny that often I do miss our exchange on various topics such as art, music, cinema and the creative ideas we used to have and which a few we even realised together. There will always be a place in my heart for the memory of the strong bond of love that we had. This collection is dedicated to him, to his genius and sensitivity. I hope you like it as much as I enjoyed working on it (though with considerable stress!). Welcome spring! Sift together the flours. Mix 100 gr butter with 35 gr flour, using a fork until all mixed in. When all uniform make a square between two sheets of cling film. Put in refrigerator for 30′-45′. Mix 35 gr butter with 145 gr flour until you have a coarse meal, take care all the butter is mixed in and you do not have any lumps. Add water until all mixed an put together a ball of dough, do not overwork it, you do not want a tough dough but a smooth and elastic one. When all mixed in spread between two sheets cling film and shape a small square. Sit in the fridge 30’-45’. Take out of the fridge and check out the different squares consistency, if the butter is harder just allow it to get a little softer at room temperature. 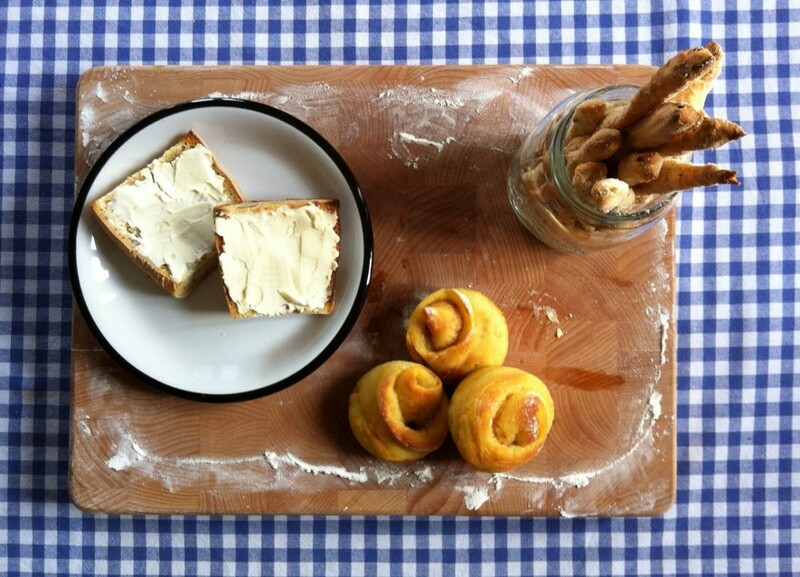 The butter mustn’t be harder than your dough. Roll your dough approx 40 x 40 cm and put the butter in the centre as showed here. Proceed doing 3 sets of 4 layers folds, resting the dough 45’ in the fridge between every set of fold. Roll out two 25 x 25 cm squares. Put the square on a baking tray covered with parchment paper and fork all its surface. Bake in 230°C preheated oven, take to 190°C as soon as you put them in. Bake 20’ on one side. Bake more 4’ minutes with ventilation mode on or else leave the oven door slightly open (you can put a wooden spoon to block the oven door to shut). Straight out of the oven, with a very sharp knife, trim the edges to obtain clean cut sheets, divide the squares in 6 even pieces. Let the sheet of pastry cool on the baking paper on a rack. Puree the strawberries and place them in a saucepan at medium heat. Bring to a boil and add the cornstarch, stirring vigorously with a whisk. Continue to stir until the strawberries begin to thicken. Put in a bowl to cool. Spread the pastry squares with the strawberry compote, sprinkle with balsamic vinegar and top with one prawn. Sprinkle with a pinch of salt. Combine the flours and salt in a bowl then sieve on a work surface. Make a well in the centre and break in the eggs. Knead with your hands until you have a homogeneous and compact dough. You have to stretch the dough away from you, then fold it back on itself. It should take about ten minutes. Wrap the dough in plastic wrap and let stand 1 hour at room temperature. You can then roll the dough with a rolling pin or with a pasta machine. My advice is to divide the dough into 4 pieces which will then be pulled with the pasta machine or by hand. For the pasta machine give a rectangular shape to each piece and pass by the widest rollers, then fold into three to give a more regular rectangular shape and continue to roll them out until the last roller. Generally when you roll at half the thickness I cut the rectangle in half in order not to have pieces that are too long, but this also depends on the work space available to you. The rectangles of dough should be laid on a floured tea towel or parchment paper, the surface should be dusted with flour and the pasta covered to prevent drying out. To cut the dough I used the classic tagliatelle cutter. As you cut them out rest the tagliatelle on a tea towel, shaping them as nests and let them dry if you want to keep them stored. If you want to cook the pasta right away, just boil them about 3′-4′ in salted water. Dried pasta should take about 7′ to cook. In a non-stick frying pan roast the pine nuts, on low heat for about 7′. Turn them over every now and then and let them brown only slightly. Be careful not to burn them because they will acquire a bitter taste. Set aside in a bowl. Clean the asparagus in plenty of fresh water, cut the hardest part and fibrous stem. If the skin is not too hard it is not necessary to peel the stem to the tip. Boil the asparagus in plenty of water, it will take about 10′ until they are cooked but still compact. Drain and cut into small pieces, about 1 cm long. In a pan melt 40g of butter and fry the breadcrumbs until golden. Set aside. Cook the pasta and in the meantime melt the remaining 20g of butter. 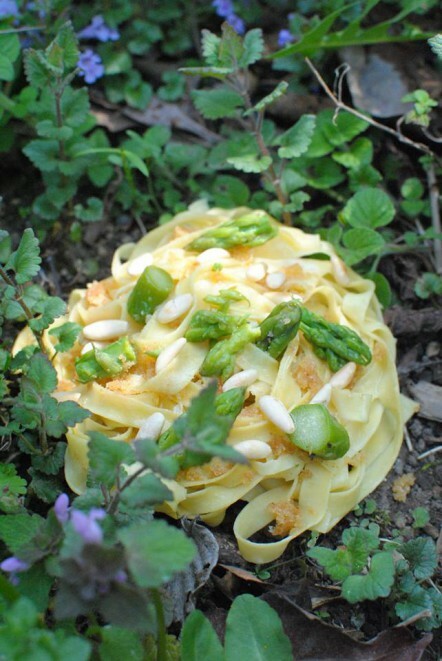 Drain the pasta and in a bowl make some layers, placing forkfuls of pasta, asparagus, bread crumbs and pine nuts. Lastly, pour in the melted butter. Finely grate the fennel and cut into strips the carrots. Sprinkle with orange juice and set aside in two separate bowls. Scald briefly the scallops, about 2′-3′ for each side. On a plate make a bed with the fennel, on top arrange the carrots and scallops. Season with a pinch of salt and serve immediately. Combine all the ingredients until you have a homogeneous mass. Line the cake moulds with parchment paper and press in an even layer of the dough. My cakes were quite high, about 1 cm. Bake at 180° C for 20′. Out of the oven let cool completely before removing the biscuit base from the moulds. Take a lot of care when de-moulding since the biscuit can break easily. Mix egg yolks, sugar and sieved flour until you have a thick cream. Add 1/3 of the cold milk. Warm up 2/3 ml milk and pour it on the mixture, be careful it mustn’t be too hot. Mix and put the pan to cook on medium heat, at bain marie, until it boils, and keep stirring the cream to avoid lumps. Cook the cream putting your pan at bain marie in a cold water and ice filled pot, be careful that no water gets in the cream. When the cream has thickened pour it in a shallow plate, spread it and cover with cling film. Rest in the fridge until use. Cut the pear to a thickness of about 2 mm, spray with lemon juice. In a non-stick frying pan put a little water, arrange the pear slices and sprinkle with sugar. Cook approximately 4’ on both sides. When the biscuit bases have cooled cover with a layer of 1.5 cm custard and arrange the slices of caramelized pear. Ė arrivata la primavera, finalmente. Dopo un inverno freddo e piovoso si inizia a sentire il primo piacevole tepore, i maglioni si fanno sempre più sottili e la lana trova posto nelle scatole dell’abbigliamento invernale. Per questa occasione ho deciso di rispolverare dal cassetto una piccola raccolta che ho messo insieme l’anno scorso per un progetto che poi non è andato a termine. La raccolta intera è stata per qualche breve ora disponibile sul blog, poi un’opportunità (purtroppo sfumata) mi ha fatto decidere di toglierla in fretta e furia per vedere se era possibile avere altri sbocchi. Alla fine purtroppo non è andata a buon fine, ma le ricette e le foto sono così belle che voglio riproporle, menù per menù e con quattro post da qui alla fine di maggio. Senza ulteriori indugi parto con la prima proposta, che trovate di seguito con le singole ricette. Alla fine di maggio pubblicherò un link con il file per completo che potrete scaricare e stampare. L’idea di fotografare gli ingredienti direttamente nella natura, per esaltare la qualità stagionale delle ricette, è stata del mio ex marito che ha avuto questa illuminazione un giorno mentre sorseggiavamo un thé assieme. Sergio è una delle persone più creative e fantasiose che conosco e non nego che spesso il rapporto di scambio che avevamo su diversi argomenti, le idee che abbiamo avuto assieme e che abbiamo realizzato mi manca. Ci sarà sempre posto nel mio cuore per il ricordo ed il forte legame di amore che ci ha legati. Questa raccolta è anche un poco dedicata a lui, al suo genio e sensibilità. Spero che vi piaccia quanto è piaciuto a me lavorarci (anche se con notevole stress!). Buona primavera! Setacciate le farine e il sale. Unite 100 g di burro con 35 g di farina, aiutandovi con una forchetta e assicurandovi che sia tutto mischiato uniformemente. Quando è tutto uniforme stendete un piccolo quadrato tra due fogli di pellicola. Mettete in frigo per 30’-45’. Unite 35 g di burro a 145 g di farina finché otterrete una farina grumosa, fate attenzione che tutto il burro sia mischiato con la farina e che non ci siano grumi. Aggiungete l’acqua finché otterrete un impasto morbido ed elastico. Non lavorate troppo l’impasto, non volete che sia troppo duro e compatto. Tra due fogli di pellicola formate un piccolo quadrato, lasciate in frigo 30’-45’. Quando tirate fuori i due quadrati assicuratevi che il burro non sia più duro dell’impasto, se così fosse lasciatelo un poco a temperatura ambiente per fare in modo che si ammorbidisca poiché il burro deve avere più o meno la stessa consistenza dell’impasto e non deve mai essere più duro. Stendete l’impasto a 40 x 40 cm circa e collocateci al centro il burro. Impacchettate e fate 3 serie di pieghe a quattro, due per volta lasciando l’impasto in frigo 45’ ogni volta. Quando dovete cuocere la sfoglia tirate due quadrati di 25 x 25 cm, che metterete su una teglia ricoperta da carta da forno. Bucherellate con una forchetta. Preriscaldate il forno a 230°C e abbassate a 190°c quando infornate le sfoglie. Cuocete 20’ su un lato. Accendete la modalità forno ventilato e cuocete altri 4’, se non avete questa opzione tenete lo sportello del forno leggermente aperto. Fuori dal forno, con un coltello molto affilato, tagliate via i bordi per ottenere quadrati dai bordi più precisi e dividetelo in 6 parti. Fate raffreddare sulla carta da forno posta su una gratella. Frullate le fragole e mettete in un pentolino e temperatura media. Portate a bollore e aggiungete la maizena, mescolando vigorosamente con una frusta. Continuate a rimestare finché le fragole inizieranno ad addensare. Mettete in una ciotolina a raffreddare. Coprite i quadrati di pasta sfoglia con la crema alla fragola, spruzzate con dell’aceto balsamico e decorate con il gambero. Salate con un pizzico di sale. Unite le farine ed il sale in una ciotola e setacciate su un piano di lavoro. Fate una fontana al centro e rompetevi dentro le uova. Impastate con le mani finché avrete un impasto omogeneo e compatto. Dovete stirare l’impasto lontano da voi per poi ripiegarlo su sé stesso finché otterrete un impasto uniforme. In genere sono necessari una decina di minuti. Avvolgete l’impasto in della pellicola trasparente e lasciate riposare 1 ora circa a temperatura ambiente. In seguito potete tirare l’impasto con un mattarello oppure con la macchina per la pasta. Il mio consiglio è quello di dividere l’impasto in 4 pezzi che poi verranno tirati con la macchina o a mano. Per la macchina date una forma rettangolare ad ogni pezzo e passateli dai rulli più larghi, ripiegate a tre per dare una forma rettangolare più regolare e proseguite a stenderli fino l’ultimo rullo. Generalmente a metà dello spessore dei rulli taglio il rettangolo per non rischiare di avere pezzi troppo lunghi ma questo dipende anche dallo spazio a vostra disposizione. I rettangoli di impasto vanno adagiati su un canovaccio oppure della carta da forno infarinati, la superficie va spolverata con farina e la pasta va coperta per impedire che secchi. Passate la pasta dai rulli che preferite, io ho usato il classico rullo per le tagliatelle. Formate dei nidi con la pasta e lasciatela asciugare se volete conservarla. Se invece volete cuocerla subito basterà sbollentarla circa 3’-4’ in acqua bollente e salata. Per la pasta essiccata invece saranno necessari circa 7’. In una pentola antiaderente tostate i pinoli, su fiamma bassa per circa 7’. Continuate a rigirarli e fateli dorare leggermente. Attenzione a non bruciarli perché acquisteranno un sapore amaro. Finita la tostatura mettete da parte in una ciotolina. Pulite gli asparagi in abbondante acqua fresca, tagliate la parte più dura e fibrosa del gambo. Se la pelle non è troppo dura non è necessario spellare il fusto fino alle punte. Fate cuocere gli asparagi in abbondante acqua, ci vorranno circa 10’ perché siano cotti ma ancora compatti. Scolateli e tagliateli a pezzetti di circa 1 cm. In una padella fate sciogliere 40 g di burro e soffriggete il pangrattato finché dorato. Mettere da parte. Cuocete la pasta e nel frattempo fate sciogliere i restanti 20 g di burro. Scolata la pasta fate degli strati in un vassoio, disponendo delle forchettate di pasta, asparagi, pangrattato e pinoli. Come ultima cosa versate il burro fuso. Grattugiate finemente i finocchi e tagliate a listarelle le carote. Spruzzate con del succo d’arancia e mettete da parte in due ciotole separate. Scottate le capesante brevemente, circa 2’-3’ per lato. Sul piatto fare un letto di finocchi, disporvi sopra le carote tagliate a listarelle e le capesante. Salare con un pizzico di sale e servire subito. Unite tutti gli ingredienti finché avrete una massa omogenea. Ricoprite gli stampi per tortine con della carta da forno e pressatevi dentro dell’impasto. Le mie tortine sonno abbastanza alte, circa 1 cm. Cuocete a 180°C per 20’ circa. Fuori dal forno fate raffreddate completamente prima di togliere il biscotto dagli stampi. Siate delicati nello sformare le basi di biscotto in quanto possono rompere facilmente. Unire ai tuorli lo zucchero e la farina finché otterrete una crema densa. Unire alla crema 1/3 del latte freddo. Scaldate i restanti 2/3 del latte e versatelo sulla crema di uova, ma attenti a che il latte non sia troppo caldo, non deve bollire! Mischiate il composto e cuocetelo a bagnomaria su fuoco medio-basso, continuando a mischiare. La crema deve arrivare a bollore, continuate a girare finché addensa. Portate la crema a temperatura ambiente e poi versatela in un piatto largo, stendetela e ricoprite con della pellicola. Mettete in frigo fino all’uso. Tagliare la pera ad uno spessore di circa 2 mm, spruzzare con del succo di limone. In una padella mettere pochissima acqua, disporre le fette di pera e cospargere con lo zucchero. Cuocete a fuoco moderato per circa 4’ per lato. Quando le basi di biscotti sono raffreddate ricoprite con uno strato di 1,5 cm di crema pasticciera e disponete le fette di pera caramellate.